Carriageworks will present the first major exhibition in Australia of work by acclaimed Italian contemporary artist Francesco Clemente, as second in the annual Schwartz Carriageworks series of major international visual arts projects. Presented free to the public from 30 July until 9 October 2016, Francesco Clemente: Encampment will include six of Clemente’s celebrated large-scale tents, transforming 30,000 square feet of exhibition space within the Redfern-based multi-arts precinct into an opulent tented village. For this exhibition, Clemente has collaborated with a community of artisans in Rajasthan, India, over three years from 2012-2014 to create a series of tents featuring intricate patterns, emblematic imagery and vividly painted human figures, both real and allegorical. The project features jewel-toned spaces populated by Byzantine angels, entwined figures, and brilliantly-hued self-portraits. Depictions of physical love, bodily pleasure, spiritual reincarnation and arcane symbols abound in these temporary dwelling, which function more like social spaces or places for introspection within an institutional context. While the interiors are hand-painted in tempera by Clemente, the camouflage fabric of the exteriors is hand-wood blocked and embroidered with golden thread by Indian artisans. The exhibition sprawls over some 30,000 square feet of exhibition space within Carriageworks, with individual tents measuring up to 18 feet wide and 10 feet high. Viewers will be invited to walk around, amongst and inside the tents to explore the works from different perspectives. Exhibited alongside the artist’s tents are four altar-like vertical sculptures – titled Earth, Moon, Sun and Hunger – which marry references to contemporary life with archaic forms. The exhibition also features a suite of 19 erotically-charged paintings from a series entitled No Mud, No Lotus (2013–2014), which draws on traditions of Mughal miniature painting. Juxtaposing luminous washes of water-colour with finely detailed ink brushwork, the No Mud, No Lotus paintings layer silhouetted bodies with serpentine forms, organic shapes and passages of flat pattern, often confusing traditional distinctions between figure and ground. As with the tents, these intimate works blend Indian and Western European influences to create a hybrid visual language – in part, figurative, in part, abstract – with which Clemente relates intimate tales of sensual and spiritual encounter. In India, the artist explains, “I found a place that was utterly contemporary and with the same vitality and drive that I knew of in the West, but in completely alternative terms”. 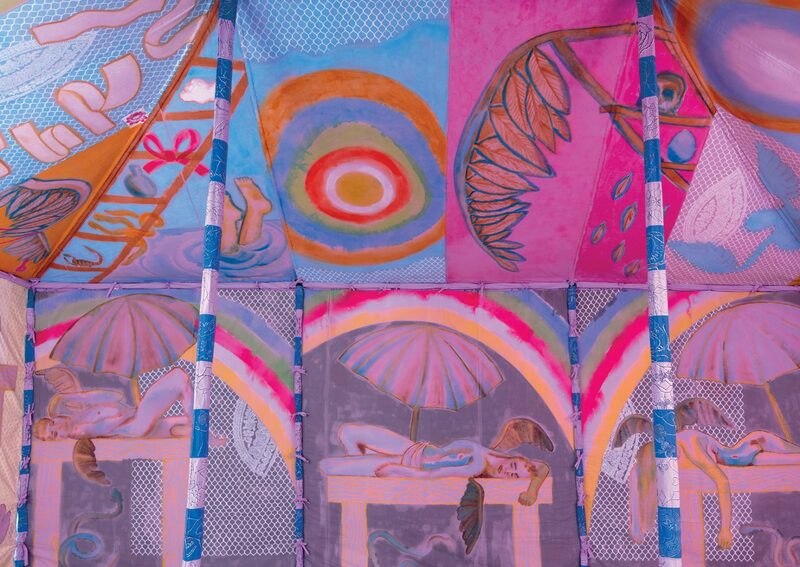 Francesco Clemente: Encampment was originally organised by the Massachusetts Museum of Contemporary Art (MASS MoCA, North Adams, MA, USA) and marks the first occasion of Carriageworks collaborating with the North American contemporary arts institution. Francesco Clemente: Encampment is presented with additional support from Horace W. Goldsmith Foundation, the Massachusetts Cultural Council and BlainǀSouthern Gallery, and Carriageworks Visual Arts Partner BresicWhitney.